In the last five years no other social media platform has grown as fast as Instagram. Not Twitter, not Facebook. Instagram not only boasts one of the highest number of users, but also the highest rate of engagement amongst users. Instagram users are far more likely to like, follow, or share content than any other social networking platforms. If social media is part of your marketing strategy, chances are you’re already using Instagram… and we both know using Instagram is so much more than just a photo-posting application. Instagram is an awesome place to share visual content and connect with your audience. From Instagram stories to Instagram TV, the social network offers several unique ways to build strong relationships with fans. That's why we want to share the 30 best Instagram business tools to help you create better content. 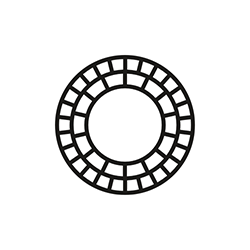 VSCO is a constant staple on the App Store’s "Top 100 Free Apps" list, and for good reason. Though one of VSCO’s primary features is its own photo-sharing social network, most users keep this app close to hand because of its wide variety of high-quality filters and photo editing capabilities, which feature enough tools to keep all but the pickiest Instagrammers satisfied. Though Instagram offers its own filters and has made strides towards offering a greater variety of editing tools, many users find themselves drawn to VSCO’s filters and tools nonetheless. This is no surprise considering the company built filters for Adobe Lightroom and Apple Aperture before creating its own app. Applying filters to photos you’re planning to post to Instagram - whether they’re taken on your iPhone or your DSLR - is a good way to make them a little more unique and iron out some wrinkles. On top of that, being consistent with the filters you apply will help to maintain Instagram brand consistency. Learn more about that here: 20 Tactful Instagram Tips You’re Missing Out On. Take advantage of VSCO’s filters and tools to make your photos pop, and, more importantly, stand out in a crowded Instagram feed. If you’re one of those picky Instagrammers I mentioned earlier (I’m guilty), Enlight may be more up your alley. Compared to VSCO, Enlight is a more fully-featured app that provides more options than its counterparts. In addition to the usual garnishing, like saturation and color temperature, Enlight features slightly more “artsy” modifiers like two-toned gradients, decals, custom typography, and curve adjustment. It also provides more drastic editing tools, photo reshaping, “healing” brushes, and even effects that turn your photos into paintings or sketches. One of Enlight's most popular features is its Mixer tool, which allows you to mix several images together to create art with a double exposure effect, as in the second photo below. This app is perfect for the businesses who demand a little more functionality (and bells and whistles) from their editing apps. More than that, however, Enlight is for those who’d prefer to stick with a single app to take care of all of their adjustments. It’s truly an all-in-one photo suite - an impressive feat, especially for a mobile app. A picture is worth a thousand words - there’s no doubt about that. But once in a while, you might find yourself needing a couple more. Font Candy is our typography app of choice, and is perfect for adding clean, stylized text to the photos you upload to Instagram. This week, the newest version of Font Candy was released, featuring tools that will be very useful for marketers (more on that later). The app features a multitude of fonts and styles in addition to a large suite of editing tools. So you have full control over the text you add to your photo. It also has spot-editing tools, in case you’d like to hide text behind a certain part of your image. In my testing, I found Font Candy to be the typography app with the most options and the best features. In terms of business use, text can be incredibly helpful. 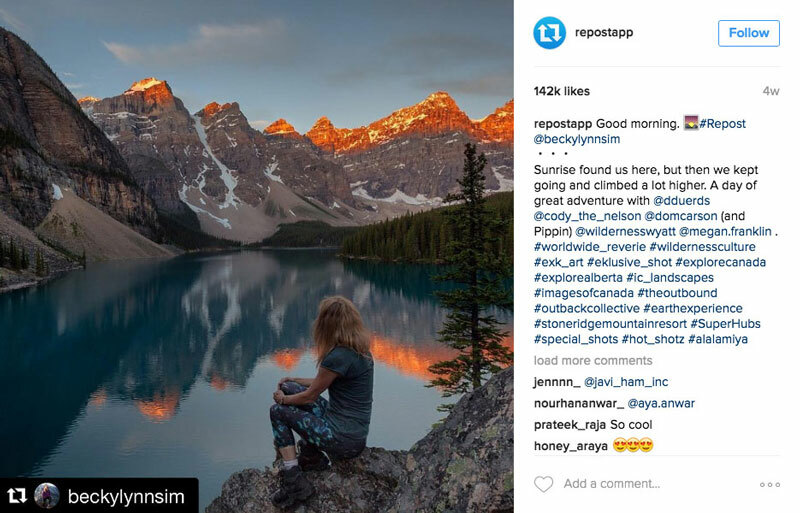 Often, Instagram users scroll quickly through their feeds without stopping to read captions. Using text (in small amounts!) on your photos to alert customers of a new product or present them with a call to action can be a great way to increase engagement. Using large, bold text can grab users’ attention, but can just as quickly distract from the photo - so don’t get too carried away! The newest version of Font Candy, which just launched this week, includes a feature called the Import Tool which allows users to import PNG file types (like logos) and font files to use in the app. This is great for businesses as it gives them the ability to overlay their logos and use their own fonts while using Font Candy. Imagine being able to easily create branded materials on the go! Pretty flippin’ sweet, huh? The advantage of using Boomerang is the fact that it can convey movement or action without the effort required for an entire video. Think of Boomerang as the real-world equivalent to those moving photos in Harry Potter. Creative business uses for Boomerang include moving product shots and silly workplace selfies - it’s a great tool to liven up an otherwise still feed, especially if you’re too busy to shoot longer videos. 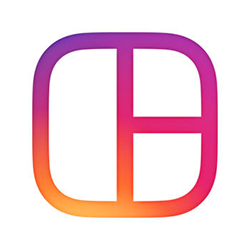 The second of Instagram’s trio of companions is Layout, Instagram’s official companion collage app. 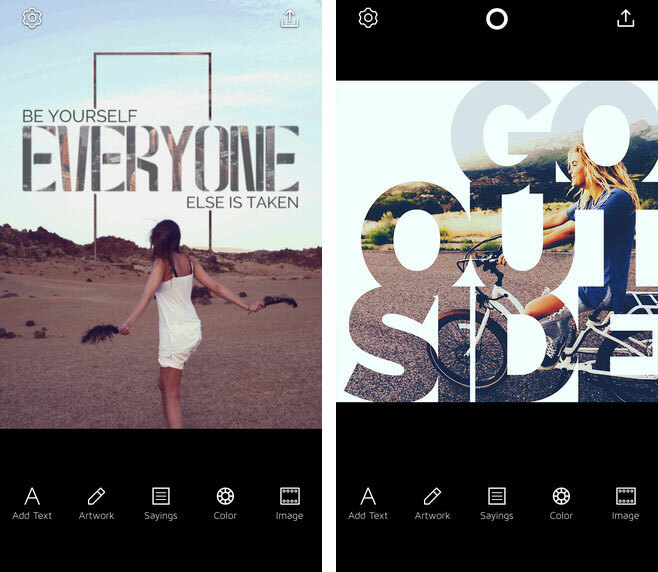 It’s a simple app that features several layouts for stitching several of your photos together. 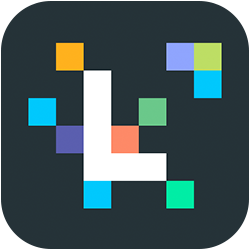 We love this app - it’s fully-featured but not bloated, with all of the tools (and nothing more) we’d expect from a collage app. This goes without saying, but make sure not to use the app too often or stitch together too many pictures. Keep your content focused. I’d say the Layout app is ideal when looking to feature multiple shots from the same product or event. For example, three different shots of your happy employees from your recent company outing, or the four colors available for your newest product. Ensuring each post has only a single purpose or focus ensures your message isn’t lost among your readers. 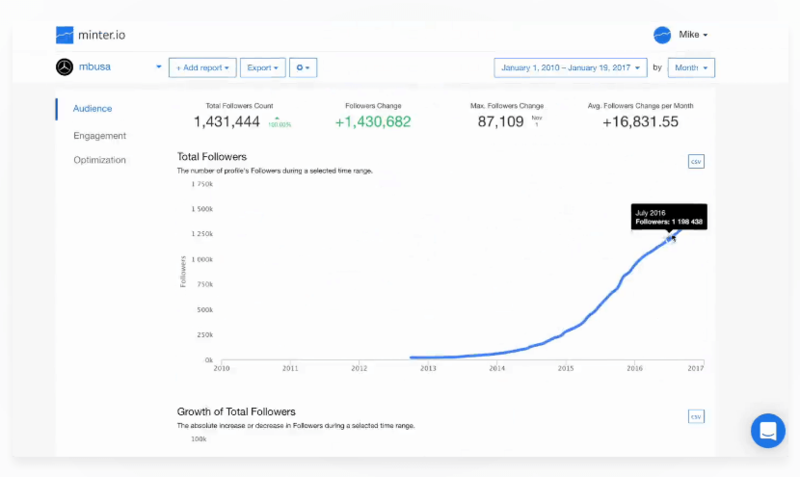 Originally a “who unfollowed me on Twitter” app, Crowdfire has grown into a tool that allows you to analyze people you follow, people who follow (or more importantly, don’t follow) you, and people you should follow. Though this seems relatively simple, it’s a great tool for businesses. Chances are, most of the accounts you’ve followed are users within your industry or target market that you’re hoping will follow you back. By seeing and unfollowing the users that don’t follow you back, you can clean up your Instagram feed, trim down your “followed” count, and subsequently increase that ever-important follower:following ratio. 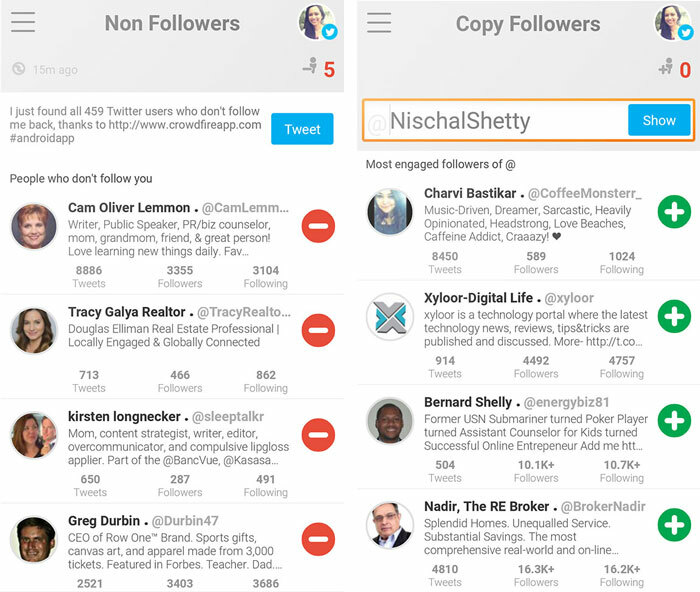 Crowdfire also shows you Fans and Admirers - followers you don’t follow back and your most engaged followers, respectively. This can help you pinpoint accounts you might want to follow back or engage with. Finally, the web-based application allows you to copy followers from other accounts, which can be a great way to engage with accounts who follow your competitors and alert them of your presence. Crowdfire also has a post scheduling tool, but I’d recommend Later, which (spoilers) I'll talk about a little further down in the article. Though Crowdfire offers a free plan, it’s incredibly limited in its features. If you're looking to seriously use it within your marketing strategy, consider one of its paid options. If it isn’t clear yet, Iconosquare is a great analytics platform for professionals or businesses looking to improve their performance on Instagram. If Instagram is an integral part to your marketing strategy, having analytics data is invaluable for tracking performance and planning your next move. If you choose to add Iconosquare to your marketing stack, focus on using it for identifying key segments and reaching out to them through Instagram-based campaigns like contests or discounts. If Iconosquare recognizes one of your followers as a key influencer, consider asking them for a shout-out in exchange for a product sample. Instagram is a platform ruled by influencers, so this is a strategy that’s particularly important to this social medium. Though there’s a wide variety of scheduling applications available for pre-planning Instagram posts, our top pick is Later (formerly Latergramme). A key thing to note when considering Instagram automation is that the platform doesn’t actually allow other apps to post on your behalf. This can be especially difficult if you’re used to using apps like Buffer or Hootsuite to schedule posts for Twitter and Facebook around-the-clock. Unfortunately for the automation-savvy, Instagram management can be a full-time commitment. Luckily, however, Later makes it easy to stay on top of your Instagram schedule. 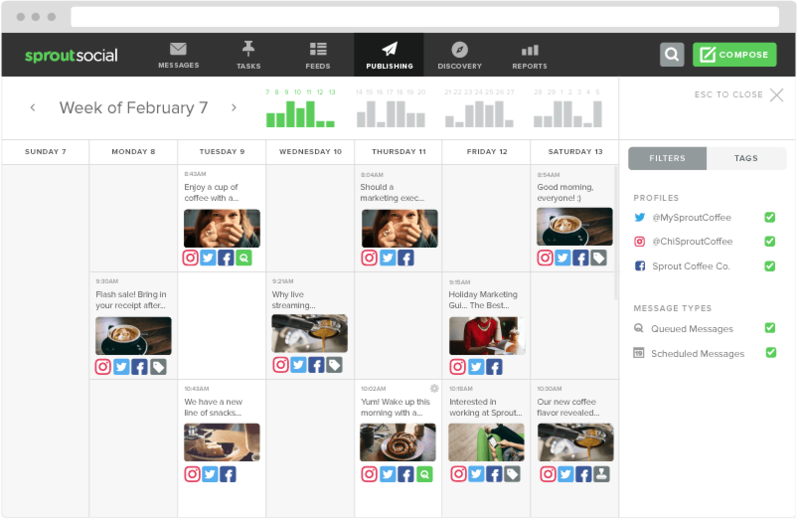 The app, which syncs across your computer and all of your mobile devices, features a visual content calendar within which you’re able to schedule your posts. This calendar allows you to upload images from your computer, Google Drive, or Dropbox, and write a caption to be posted with the image. Due to the aforementioned limitations, Later won’t actually post the image when it reaches the scheduled time. What it does do, however, is send you a notification on your device reminding you to post. It streamlines this process by copying your image straight to Instagram along with your caption - so all you need to do is hit “post.” That’s about as easy as it gets when it comes to automating your Instagram posts. Use Later on your business account to optimize your post timing and to spread out the frequency of your posts in order to reduce flooding followers’ feeds and to maintain a relatively consistent content schedule. If your business uses a particular hashtag, Later makes it simple to search through posts with this hashtag, so you can feature user-generated content on your own profile. 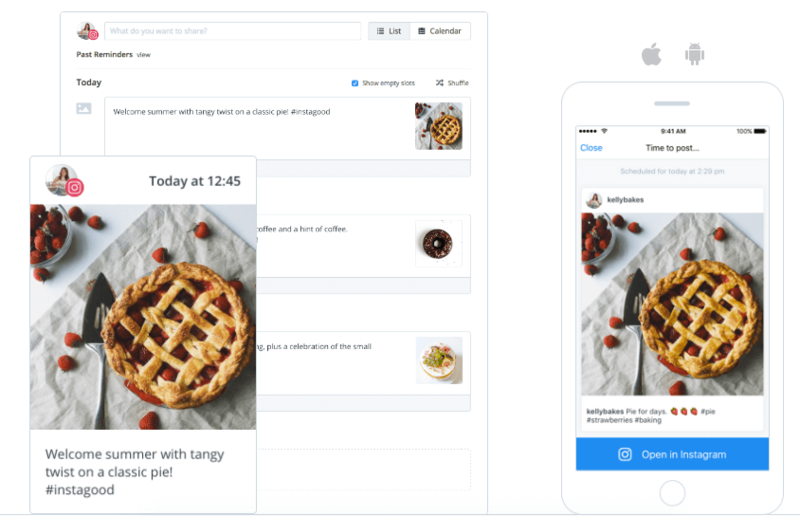 The app even offers DM marketing tools to help your business connect with customers through Instagram (and Twitter) direct messaging. All in all, I’ve found Later to be a great, fully-featured Instagram scheduling tool, with its functionality gated only by Instagram’s own limitations. Repost is a book you can judge by its cover, because it does exactly what it says. 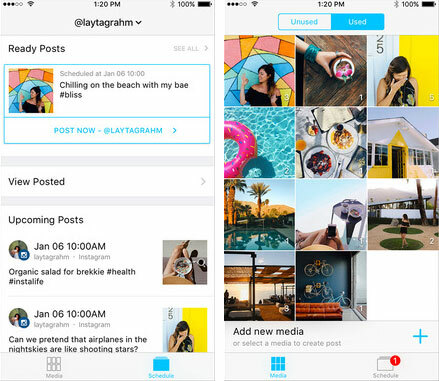 The free app makes it hassle-free to repost Instagram photos from other users. 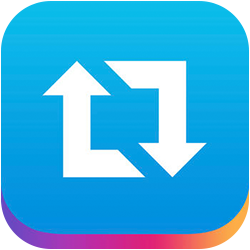 It instantly copies the photo you’d like to repost and places a small text box with the handle of the user you’re reposting. It also automatically copies the photo’s caption onto your device’s clipboard if you choose to feature it when posting. Depending on your business, you may find value in featuring user-generated content on your Instagram feed. It’s a great way to incentivize users into spreading the word about your product through social media, and it’s great for highlighting the features and benefits of your product. You’ll find more success if your product has at least some sort of aesthetic appeal, especially because Instagram is a platform centered around looking pretty. In terms of best practices, make sure you credit every user you repost; I’d also make it a point to ask them (in a comment or direct message) for permission to feature their photo on your page. Most are happy to comply, but it’s best to ask, just in case. Finally, either feature the caption the original user wrote, or make your own comment on the post. How many times have you seen this on Instagram? One of the platform’s biggest limitations is its lack of locations for links outside of an account’s bio. Links posted in photo captions aren’t hyperlinks, meaning viewers need to copy it or manually enter it into their browsers - not exactly convenient. This is a particular frustration with accounts owned by news publications or retailers, as they’re constantly looking to lead their audiences towards different links within their websites (e.g. new products or articles). Soldsie's solution is Have2Have.It, a service that provides Instagram accounts with a single link for your bio (see image above) that showcases content and allows you to link photos to content. Basically, it creates a page with a clone of your Instagram feed with the difference that each photo links to whatever you’d like it to, whether that’s a product page or a new article. The service offers conversion tracking, and analytics; and supports multiple products per post, as well as integration with Shopify. 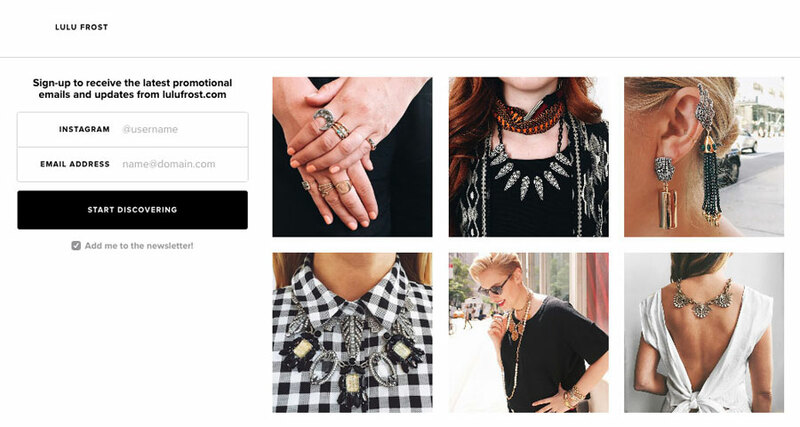 For example (see above), a jewelry company like Lulu Frost can link each photo on their Have2Have.It page to the product page for the item featured in each item. This is a huge solution to Instagram’s one-link problem, as constantly updating your bio link means people wanting to find links to content featured in older posts won’t be able to. Giving your customers a greater number of opportunities to find your products means increased traffic and (hopefully!) conversions. Finally, each Have2Have.It page features a form to collect Instagram handles and emails from viewers, which will help you bolster your list of leads. Because these leads have already shown a great interest in your product (i.e. they visited your Instagram profile, clicked the link in your bio, and gave you their contact information), they’re much more likely to convert than leads from other sources. 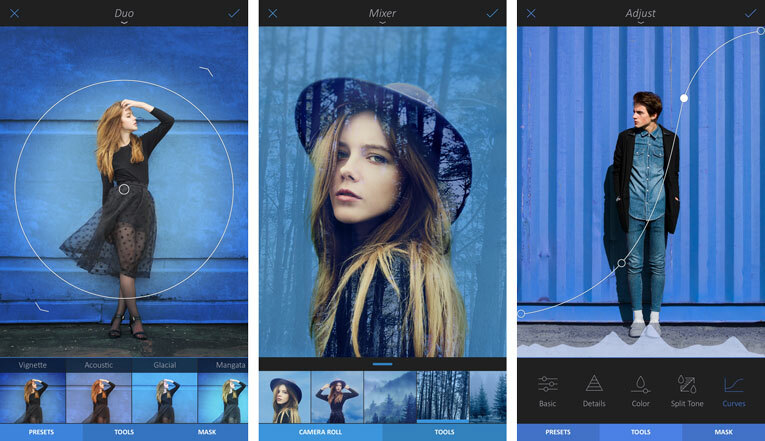 Coming in at one of the top 5 most popular photo editing apps is Afterlight. Just like VSCO or native Instagram tools, Afterlight offers a wide selection of photo filters and editing tools designed to take your photos to the next level. The app itself is free on IOS and a dollar on Android. The app comes preloaded with several dynamic filters. 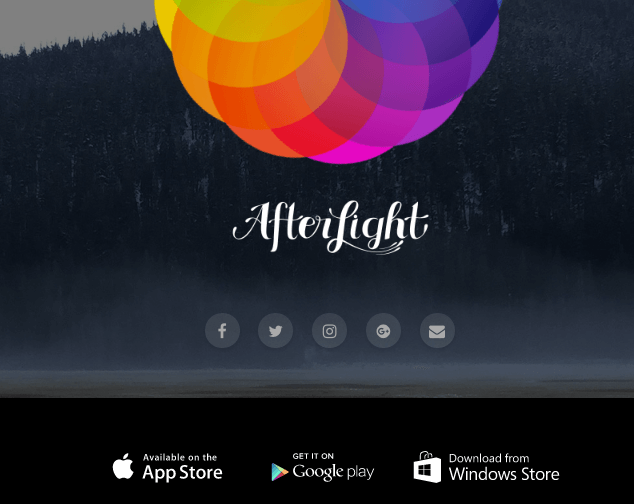 If you want more filters you can browse through the Afterlight store and see what filter packs suit your style. Where Afterlight separates itself from other photo editing apps is it's large selection of editing presets. There are 74 unique filters, 78 natural textures to overlay, and 128 frames to experiment with. Wishpond's favourite social media management app Buffer is no slouch when it comes to Instagram. Buffer's relatively new Instagram tool features allow you to pre-schedule Instagram posts. Upload your photo/video, add in your caption, and hit schedule. When it's time to publish the post Buffer will send you and notification. Your pre-scheduled post will then be loaded into Instagram and all you'll have to do is hit publish. Buffer itself provides a whole host of tools to plan, track, and amplify your social media strategy. You can track key analytics, schedule, work with your team, and much more. Wouldn't it be nice if your followers could just shop your Instagram feed? With Like2Buy you can create a shoppable version of your own Instagram feed. Like2Buy essentially creates a separate webpage that looks exactly like your Instagram feed, except you know, your followers can buy from it. The web page is taken directly from the photos you've posted so your customer isn't confused when they're redirected. After signing up for Like2Buy you'll receive a custom URL to place on your Instagram bio. When a follower sees something they'd like to buy, all they need to do is click the link. The link takes followers to a duplicate website where they can purchase whatever they see on your Instagram. Smart right? 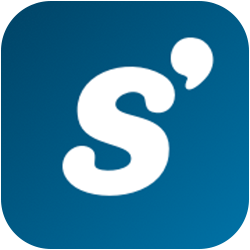 SimplyMeasured is one of the leaders in social media analytics. It provides a serious amount of data for those looking for more precision. Not only for Instagram but for all of your social media channels. It offers a comprehensive amount of data about your actions on Instagram. Plus full reporting on all the data it tracks. 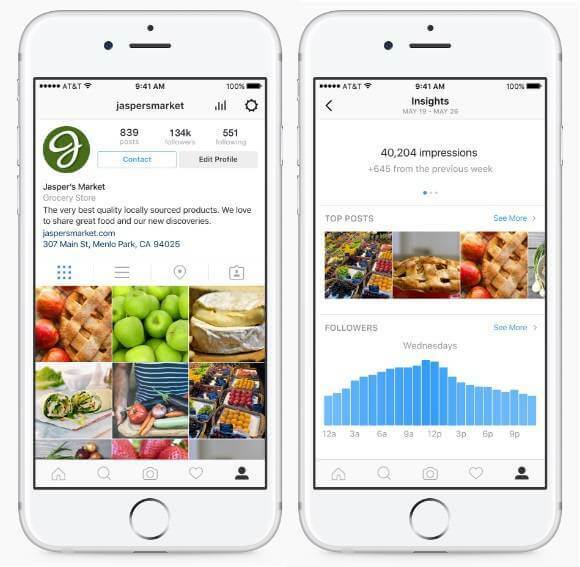 Benchmark the performance of your Instagram account against your competitors. See what photos do best at what time. Compare up to 150 different Instagram accounts to see where your efforts are needed most. What more can I say about one of the most complex Instagram tools on the market, you'll just have to explore it for yourself. Is all your Instagram content backed up where it needs to be? Vibbi might be the Instagram tool for the job. 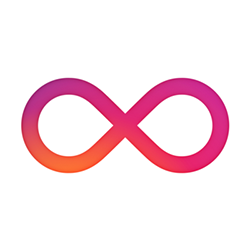 Vibbi makes it easy to manage and backup all the content you share to Instagram. Cause we all know that a technical error or a misstep can easily erase the Instagram feed we put so much effort into curating. Use Vibbi to easily go into your Instagram and download all your content to a hard drive. You can never be too safe! Need an app to help you manage all the product you're selling online? 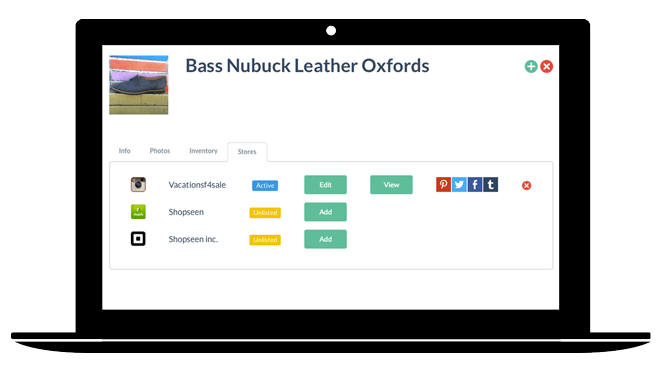 Shopseen lets you Create listings on any store, update inventory and keep your quantities in sync automatically down to SKUs. Like Like2Buy Shopseen can also create an Instagram store based on your Instagram feed. Not to mention schedule posts, create embeddable buy buttons, and more. 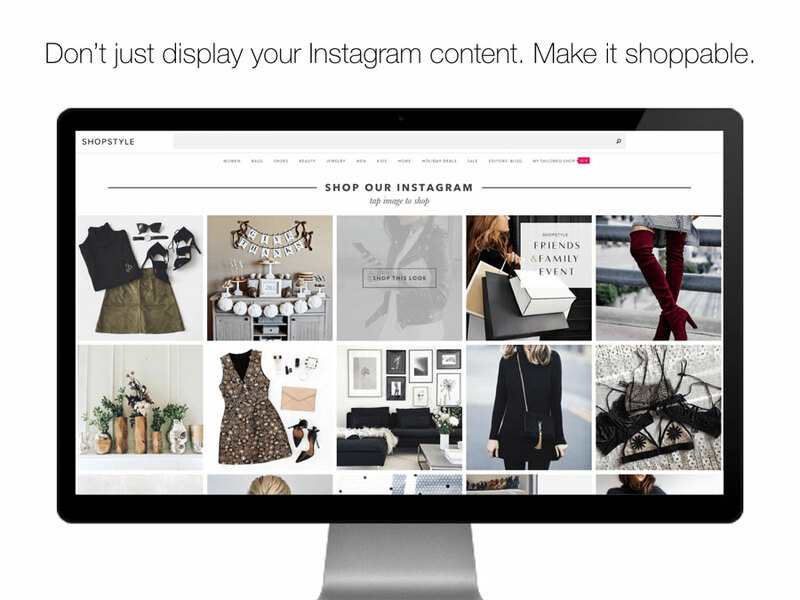 Shopseen aims to be the complete Instagram ecommerce assistant. 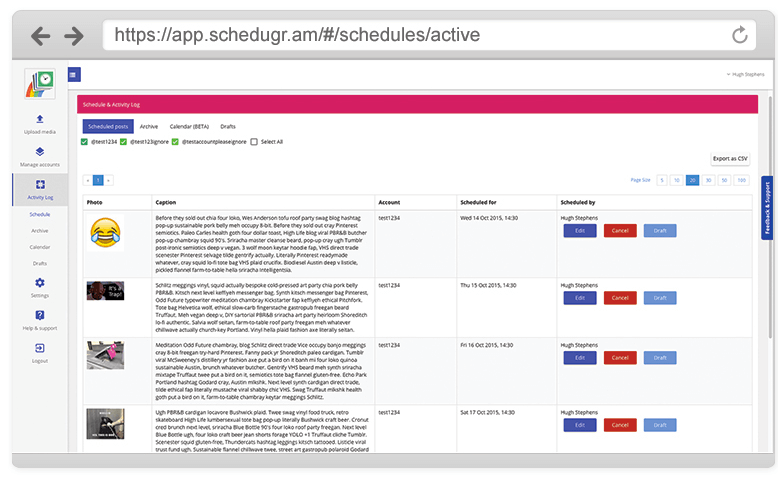 Schedugram is one of the first and mostly widely used Instagram scheduling tools on the web. 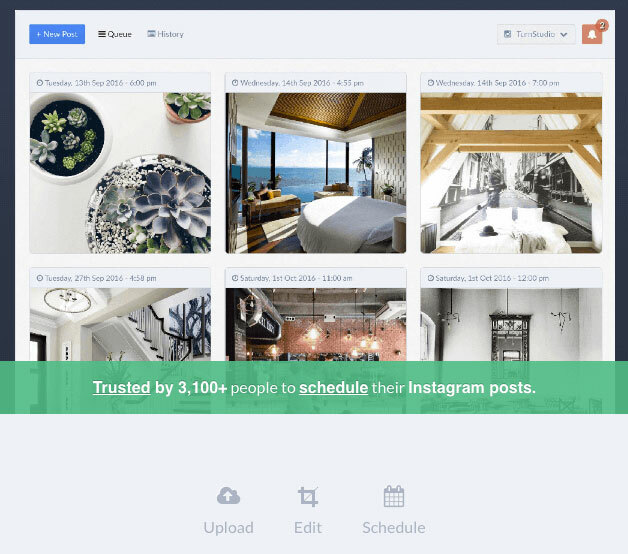 If you're looking for a no-fuss Instagram scheduling tool to help you manage you and your client's content, Schedugram is it. It offers post scheduling for multiple accounts and users. 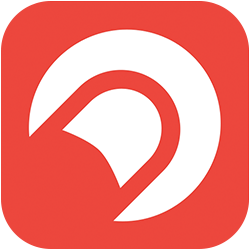 It's a straight forward Instagram tool for straight forward users. Over is the ONLY contemporary and stylish app you need for overlaying text on photos. Quotes, logos, effects, you name it Over has it. 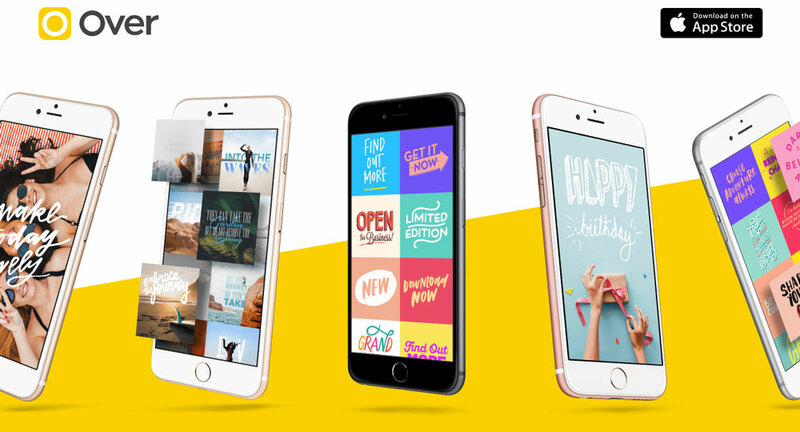 The Over app is built to help anyone make creative and beautiful text images. Aside from the tools the entire app is built with a strong creative focus and a buttery smooth UI. There are a lot of apps that let you put text on your photos but there are none like Over. You gotta try it. Snapseed (now owned by Google) can be described as an in-depth or advance mobile photo editing tool. Unlike tools like VSO or Afterlight, Snapseed allows mobile photographers to make more precise edits on-the-go. It features a whole host of editing tools, filters, and frames to play around with. If you're looking for a more robust mobile photo editing app, Snapseed should meet all your requirements. If you missed the press release Instagram now has it's own suite of business analytic tools. Anyone who has set up and manages a business account on Instagram has access to these tools called Instagram Insights. Insights will give you data on things like post impressions, reach, website clicks, and follower activity. If you want to go a bit deeper into how you're performing on Instagram check out your Insights. This Instagram tool rocks cause it's also free! Yotpo provides an easy way to get more online reviews, boost traffic, and increase sales. 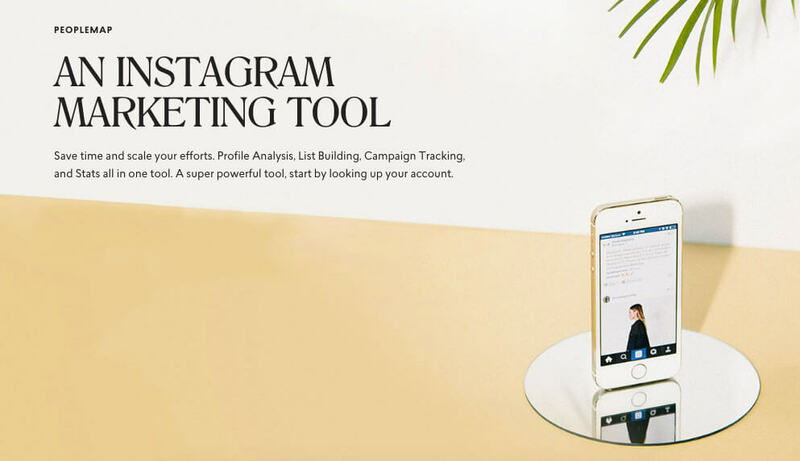 Aside from a whole host of other marketing tools, Yotpo also offers tools to help you sell, curate, and run ads on Instagram. Create a shoppable Instagram feed like Like2Buy, curate content from fans in your industry, and build Instagram ads all on the Yotpo platform. SocialRank is the easiest way to identify, organize, and manage your followers on Instagram and Twitter. This Instagram tool is built for teams to organize and filter through their followers and identify social marketing opportunities. Once you've identified a list of followers you'd like to export you can do so to a CSV. Perfect for locating influencer outreach opportunities or surprise and delight campaigns. Minter is built to make Instagram account and hashtag analytics easier for businesses. It features Instagram tools to help you optimize posting times, monitor hashtags, track sentiment, export data, and more. What makes Minter great is its ability to simplify your data. Data and numbers can get confusing, let's be honest. A program that can provide suggestions and interpret your data for you is a godsend. 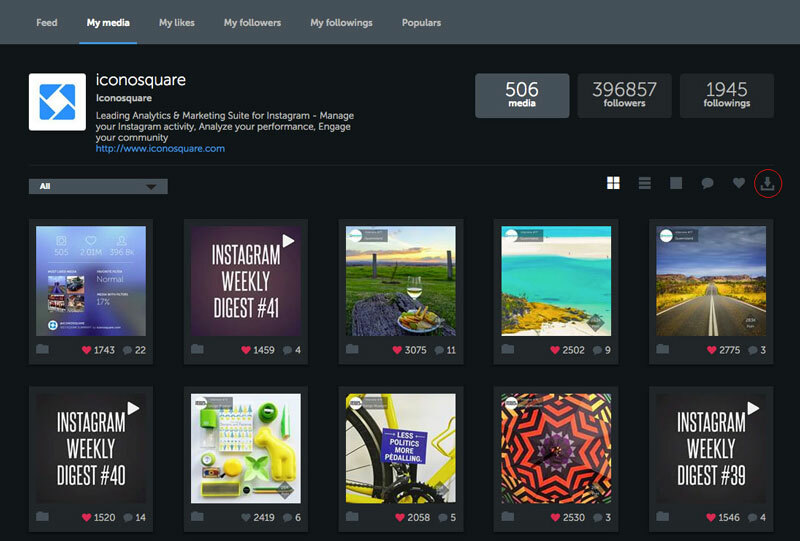 Social Insight provides Instagram analytics and marketing tools. This Instagram tool helps you monitor engagement, follower growth, interactions and more. It's built to help brands understand their followers through in-depth insight data. Right off the bat use Social Insight to see things like followers lost, average daily change, percent change, number of posts, interactions post, and much more. Set up custom tracking and manage it all with sharing across teams. Analyze any account, calculate engagement rates, build lists, set campaign notifications, and see all your statistics inside Peoplemap. The in-depth account analysis makes Peoplemap suitable for anyone looking to get more out of their Instagram data—in a stylish VSCO-esque type of way. Like most Instagram analytic tools out there Peoplemap is for those who want more precision and data-based decision making. Where Peoplemap differs is in its friendly user interface, boasting much more style than any other analytic tool out there. Build targeted lists, find responsive influencers, and be more efficient on Instagram with Peoplemap. Hootsuite is one of the earliest and most popular social media management platforms on the market. 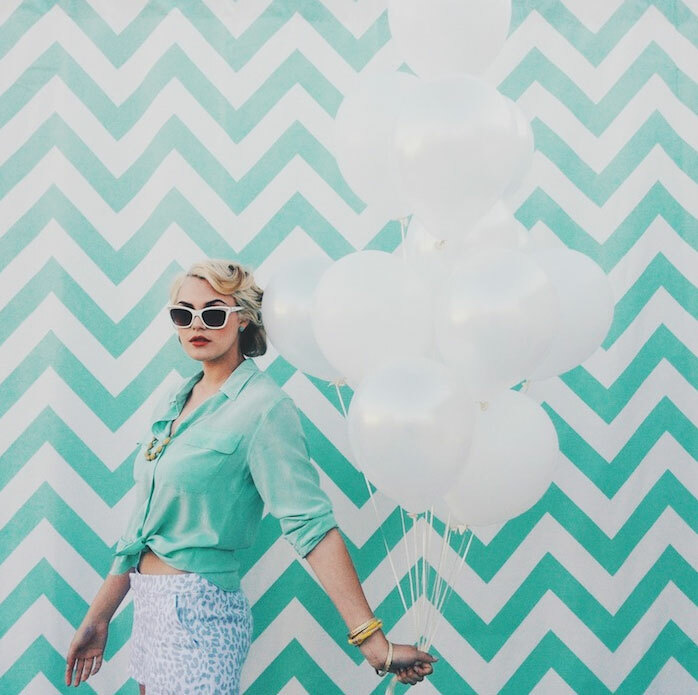 Last year, much to the delight of users, Hootsuite added support for Instagram. Like Buffer, you can pre-schedule posts for Instagram and be notified to publish at your specified time. 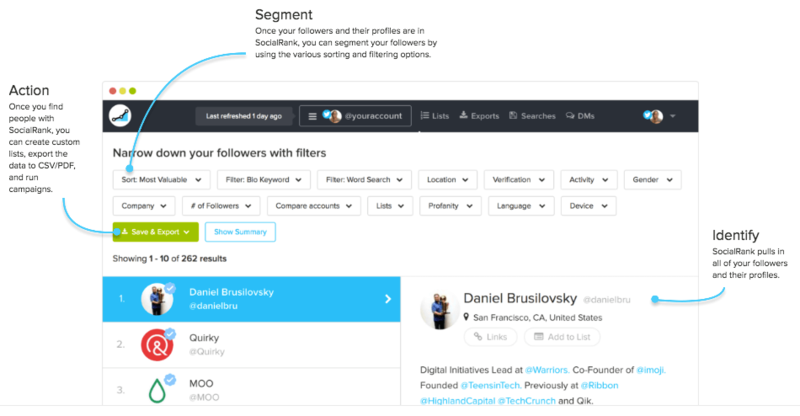 Amongst other things, subscribers get access to all of Hootsuite's robust social media management features. In terms of value for your money it's hard to deny Hootsuite from a list of best Instagram tools. Like Hootsuite, SproutSocial offers a powerful social media management platform. On SproutSocial you can schedule posts, manage comments, monitor hashtags and run reports. SproutSocial also features a beautiful UI that's easy to use. If you're in the market for a complete social media management platform you can't go wrong with SproutSocial. Hopper touts itself as the ultimate Instagram scheduling tool. By way of some sort of technological magic, Hopper allows its users to schedule and automatically post to Instagram. Where other apps require you to manually hit 'publish,' Hopper manages the publishing part for you. Inside Hopper you can also track other accounts, edit images, upload from Dropbox, and repost photos. A pretty good deal for the price we say. For those that operate an ecommerce shop through Shopify, the Shoppable Instagram tool by Foursixty is a life saver. Easily build and publish a shoppable Instagram feed that connects directly to your Shopify store. 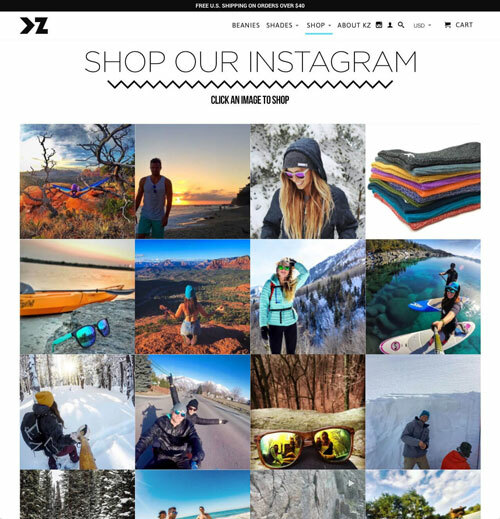 Embed product specific Instagram posts right on product pages all with the Shoppable tool. It also comes with all the other Instagram tools for business you'd expect, scheduling, analytics, curation, and more. Here's another option for Shopify users looking to create a shoppable Instagram feed. Showcase for Shopify allows users to easily build galleries from their Instagram feeds for their followers to shop through. Like the previous tool we mentioned, Showcase supports tagging, embeds, tracking, and more.